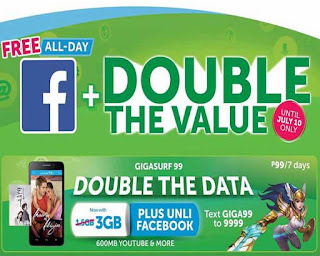 Smart double the data on some of their internet promos, including Gigasurf package. From the previous 1.5GB data allocation of Giga Surf 99 now comes with 3GB of mobile data plus they added unlimited Facebook and FB Messenger access while registered to this promo. Your 99 pesos are valid for 7 days, so you can have more time connecting your friends and love one online. You can also enjoy streaming using the free 600MB data for YouTube, iFlix, Vimeo, iWant TV and more. This is not included or counted from the allotted 3.5GB data of this promo so you can have more bandwidth to browse any site you want. The quickest way to register or subscribe to Giga surf 99 promo is via SMS or text using the keyword provided below. You can also check other Giga Surf 499 if you want 30 days internet promo validity. Note: This promo is available for Smart Prepaid and Smart Bro Prepaid subscribers only. This is a limited time offer and promo runs until July 10, 2017. Make sure you receive the SMS notification from Smart after you successfully register to Giga Surf 99 to avoid the unwanted load deduction on your account. If you use this promo for downloading movies and large files, make sure you have a good signal reception to avoid disconnection problem and data loss. It’s better to use LTE SIM and connect to 4G/LTE network when subscribing to GIGA SURF 99 promo. 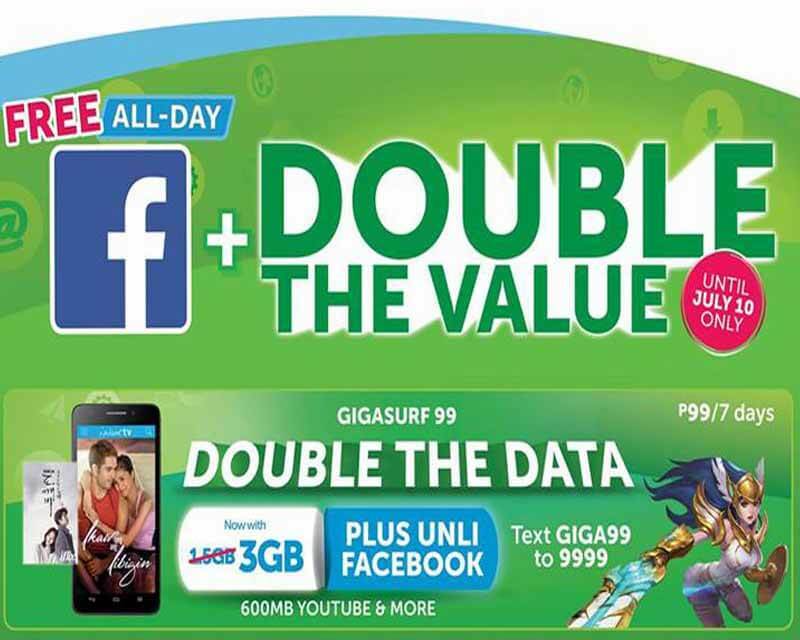 Hi.. sana po ma Ibalik nu nman ang double data promo ng GIGA99. Ang laking tulong po sa amin na nasa Sales na kailangang nka online lagi. Ang laki po kasing tip is sa budget. Sana pa ma pag Bigyan. More power and God Bless smart.